Russian authorities warned the FBI in early 2011 that suspected bomber Tamerlan Tsarnaev may have been a follower of “radical Islam,” a revelation that raised new questions in Congress on Saturday about whether the Boston Marathon attacks that killed three and wounded more than 170 could have been prevented. A senior congressional aide privy to the Boston Marathon terror investigation confirmed Saturday that the FBI received the warning after Tsarnaev’s apparently suspicious activities caught the attention of Russian authorities keeping close surveillance on militant Islamist groups in the Caucasus region of the former Soviet Union. The FBI acknowledged Friday that it had investigated Tsarnaev in 2011, even interviewing him and his family, but “did not find any terrorism activity,” either domestic or foreign. Tsarnaev, 26, who was killed in a firefight with police in Watertown early Friday morning, had traveled from Boston to Russia several times in recent years, including an extended stay in 2012, according to multiple US officials who have reviewed his passport file. Tsarnaev and his younger brother, Dzhokhar, are ethnic Chechens who came to the United States from Kyrgyzstan, a former Soviet Republic in central Asia. The bureau declined to answer questions Saturday about whether it revisited its 2011 investigation of Tamerlan Tsarnaev after the Marathon attack, or why the bureau was unable to identify the suspects in race day security footage two years after interviewing him and his family. Dzhokhar Tsarnaev, 19, was searched by law enforcement officers in Watertown, seconds after his capture on Friday. 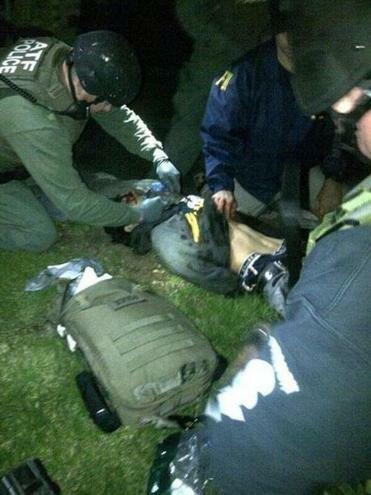 Dzhokhar Tsarnaev, 19, was captured by police Friday night in Watertown after eluding a manhunt for more than 20 hours. He is in Beth Israel Deaconess Medical Center in “serious but stable” condition and not yet able to communicate, Governor Deval Patrick told reporters Saturday. As questions mounted over the FBI’s prior experience with the alleged bomber, Greater Boston reveled in the capture of the alleged terrorist and took another step to returning to normal. Friday’s Boston Red Sox game was canceled while Dzhokhar Tsarnaev was on the loose, but Saturday’s game was held as scheduled, the team’s first home game since last Monday’s bombing. Members of law enforcement who pursued the alleged bombers were honored on the Fenway infield before the game. Fans cheered Boston Police Commissioner Edward Davis as if he had just shut out the Yankees. While the return of the Red Sox brought some sense of normalcy to the city, 52 people hurt in the bombing remained in Boston hospitals on Saturday, and the heart of Back Bay, where the bombings took place, remained closed for the continuing investigation. The dramatic encounter that led to the death of one of the brothers and the capture of the other followed a decision Thursday by the FBI to release video and photographs of the suspects, in an effort to have the public help identify them. The images showed Tamerlan Tsarnaev in a dark cap and carrying a backpack — believed to have held a bomb — on Boylston Street. Dzhokhar Tsarnaev is pictured in a white cap, also carrying a backpack. The decision to release the photos came after two days of silence from the FBI, during which they tracked down thousands of tips without making an arrest. But hours after the images were released, the suspects allegedly unleashed a wave of shocking violence, fatally shooting Massachusetts Institute of Technology police officer Sean Collier in Cambridge, then carjacking a motorist and engaging in a gun battle with Watertown police in a residential neighborhood. MBTA transit officer Richard H. Donohue Jr. was shot in the groin and hospitalized. Investigators worked on Saturday around the boat where Marathon bombing suspect Dzhokhar Tsarnaev was found hiding afteramassive manhunt. Security experts said the relatively high quality of the photos and the state of the investigation gave law enforcement no choice but to put to go public. Mitch Silber, an executive of K2 Intelligence in New York and the former director of intelligence analysis for the New York City Police Department, said that as the investigation stalled, the argument for the photos’ release became more compelling. US Representative Stephen Lynch, whose district includes parts of Boston, said Saturday that he has a number of questions for US and Russian officials about what they knew about the brothers, and when. Lynch, who sits on a congressional oversight panel on terrorist financing, says another key question is how the alleged terrorists became radicalized in the first place. “Did that happen with direct foreign assistance, or were there mentors who guided them in this operation and inspired them?” he said. Lynch, a Democrat who is running in the special election for a Senate seat, said investigators are also scrambling to learn more from the Russian government about why Tamerlan Tsarnaev gave them concern in 2011. Lynch added that he believes Congress must ultimately play a role in getting more answers and determining if the attack could have been stopped. “As we saw on Patriots Day, terrorists are now turning their attention to targets that are more difficult to secure,” said the Malden Democrat, who has previously served on the House Homeland Security Committee. President Obama convened the National Security Council on Saturday for 90 minutes in the Situation Room on the Boston attacks, including an update on the capture of Dzhokhar Tsarnaev. The president “underscored the need to continue gathering intelligence to answer the remaining questions about this terrorist attack going forward,” according to the White House. The alleged bomber’s uncle, Alvi Tsarnaev, said in an interview with the Globe that the elder nephew, Tamerlan, visited his father in the restive Russian province of Dagestan, which neighbors war-torn Chechnya. But Alvi Tsarnaev said he did not know who else his nephew may have been involved with while overseas. The Russian Foreign Ministry in Moscow and Russian embassy in Washington did not return calls seeking comment. The FBI and White House pointed reporters to the bureau’s Friday statement. Also Saturday, federal authorities swept through the same New Bedford residence that they had searched the day before in relation to the manhunt for Tsarnaev. But this time, they left with two men in custody. A spokesman for Immigration and Customs Enforcement would only say, “ICE Homeland Security Investigations special agents arrested two foreign nationals this afternoon in New Bedford, Mass. These individuals were arrested on administrative immigration violations.” No other information was released. As Watertown, the scene of Friday’s firefight and manhunt, began returning to normal Saturday, more details filtered out about the capture of Dzhokhar Tsarnaev, who was discovered bleeding and hiding in a boat in a backyard on Franklin Street. Just moments after State Police wrapped up an afternoon news conference on Friday and lifted the order to stay inside, acknowledging they did not know where the suspected terrorist was, a 911 call came in to Watertown police. 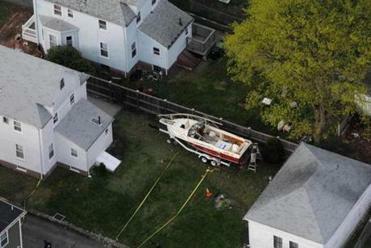 The caller said someone was in a boat in a backyard, bleeding and moving. Watertown police rushed to the scene, followed quickly by hundreds of Boston police officers, federal law enforcement officials, and officers from other agencies still in Watertown. Boston tactical teams made up of dozens of SWAT officers led by Sergeant Jack Mahoney swarmed the house, setting up a perimeter around it. Above, a State Police helicopter hovered for another view. Dozens of officers and federal officials moved into the backyard on foot and as they neared the boat, Tsarnaev suddenly moved from his hiding place and raised his hand. He looked to be holding something. Immediately, officials opened fire. Officers backed off, keeping a distance of about 30 feet from the boat. Worried that Tsarnaev might be wearing an explosive device, police brought in an armored vehicle, equipped with a robot that could peel back the wrap covering the boat for the winter. The standoff lasted nearly two hours, as officers watched the boat closely. “No movement,” they would report occasionally. Then, Tsarnaev stirred. He held his hands up. He was covered in blood. Not taking any chances, officers began to hit the boat with flash grenades, which emit a loud blast and a bright light designed to disorient suspects. They used at least a dozen of the devices, trying to ensure as much as possible that Tsarnaev would be too stunned to fight back. SWAT officers then swarmed the boat. Watertown police Chief Edward Deveau said yesterday that the name of the boat was the Slipaway II.